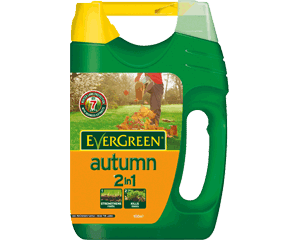 Mellow Mummy has been testing out her green fingers in the garden with Evergreen's Autumn 2 in 1 Lawn Care. Normally when it gets to this time of year I abandon all hope in my garden and leave it to do its own thing. Then, come the spring, I spend lots of time, effort and money trying to bring the lawn back from the dead with weedkiller, moss killer and grass feed. This autumn I'm pleased to be giving my lawn a little TLC before winter sets in. I applied the Evergreen Autumn 2 in 1 10 days ago on a fine but autumny day. This lawn feed is specifically designed for applying between September and November. It was incredibly easy to apply because the container it came in had a handle and spout so that I could easily apply it to my lawn without having to get messy or having to worry about filling a spreader. The 3.5kg carton was enough to cover most of my back garden (officially it covers 100 square metres) and it literally took me 5 minutes to apply. I simply opened up the spout and started walking up and down the garden as the little sprinkles trickled out at a controlled speed. Autumn 2 in 1 is designed to strengthen the lawn in time to fight off the cold and damp on winter. It is also supposed to be able to kill off moss which, in my lawn, has pretty much taken over since the wet and cold weather took hold. Usually after applying a moss killer I notice the lawn start to blacken after a few days where the moss is dying but this one doesn't seem to have had much effect on the moss if I'm honest. However, 10 days later the lawn does look noticeably greener and sturdier on the areas where I applied the feed and thankfully it hasn't encouraged it to grow too much (I wouldn't want the lawn to shoot up at this time of year). Autumn lawn care is not something I had considered before but I think I will try harder if garden maintenance can be this easy!